Fire up the romance this holiday with Robin Lee Hatcher‘s latest offering in the King’s Meadow Romance series, Love Without End. For two single parents with bruised hearts, it’ll take more than a little courage to get back on the horse when it comes to love. Enter today by clicking the icon below. But hurry, the giveaway ends on December 14th. Winner will be announced December 15th on Robin’s blog. Two months ago I attended the American Christian Fiction Writers conference in St. Louis, MO. Amongst the plethora of amazing published Christian writers was Robin Lee Hatcher, who had the privilege of being awarded the Lifetime Achievement Award by the organization. Author of Love Without End, Hatcher is a prolific writer known in publishing industry for her stories of love and faith. While at the time of the conference I had not yet read any of Hatcher’s books—and she has many—I immediately added this author to my “to-read” list. Love Without End is a Western-style romance set in the fictional town of Kings Meadow, ID. Surrounding two families hurting and healing from death and lies, Hatcher’s story centers around the themes of forgiveness, love, and familial relationships as Chet Leonard, Anna McKenna, and Kimberly Welch find their callings as individuals and within a community. 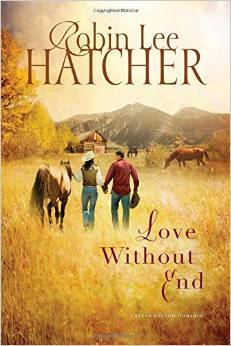 Not long after beginning Love Without End it was obvious why readers love Hatcher’s books—she writes with heart and passion for her stories. The details in the second novel of her Kings Meadow series infuse this book with authenticity; readers who say they want to move to Hatcher’s fictional town are justified in believing Kings Meadow could truly exist. Love Without End’s characters add to the novel’s relatability. Anna, Chet, Kimberly, and the children of this novel could easily be found walking the streets or attending classes in any all-American town. Despite the aspects of the novel that I enjoyed, I was still disappointed by Love Without End. I had high expectations for this book because of the accolades Hatcher has received over her many years as a writer. In winning Christy Award, RITA Awards, RT Career Achievement Award, and RWA Lifetime Achievement Award, in addition to her recent win of ACFW Lifetime Achievement Award, I expected Hatcher’s novel to be filled with spiritual depth and deep prose. Instead, Love Without End reminded me of a basic inspirational story that skims spiritual ideas and moving themes but never searches for character motivations or sub-textual context. The first half of Love Without End moved at a decent pace, with the introduction of the characters and setting acting as catalysts for motivation. The latter half of the novel, however, fell apart—the pacing of the plot felt rushed, but the story read slowly and the denouement did not stir my emotions. The saving grace of Love Without End, in my opinion, are the chapters that unfold Anna McKenna’s history from the 1940s to the 1960s. I enjoyed reading about her life on the ranch during World War II because her position within the Leonard family allowed for a variation on the familial unit. While this novel is not my highest rated, I still recommend Love Without End as a sweet light read of inspirational themes for those who like stories set in the West about cowboys and ranching. I will keep an eye on Hatcher’s novels when I am in the mood for a lighter novel that gives characters a happy-ever-after without question. *I was provided a copy of Love Without End by Thomas Nelson Publishers. Thank you to Litfuse Publicity Group for hosting my review for the blog tour of this novel. I received no compensation for writing this review; this review is in compliance with FTC’s guidelines. Today I have the distinct pleasure of welcoming my good friend, and fellow University of Delaware alumni and English major, Rachel Carey, to A Way With Words. I’ve known Rachel for about seven years now (what a blessing to have friends for such a time) and got to know her quite well when we served as fiction editors for Ceasura, UD’s literary magazine. Aside from her superb editorial skills, Rachel is also a terrific literary writer. When the time came to find reviewers for Dawn’s second novel I knew I wanted to ask Rachel to join the team. Her history as a prolific creative writer is just what authors look for in a reviewer. I hope you enjoy Rachel’s review of The Bound Heart. Be sure to keep an eye out for this young lady’s work–someday, you may see her name on your bookshelf. 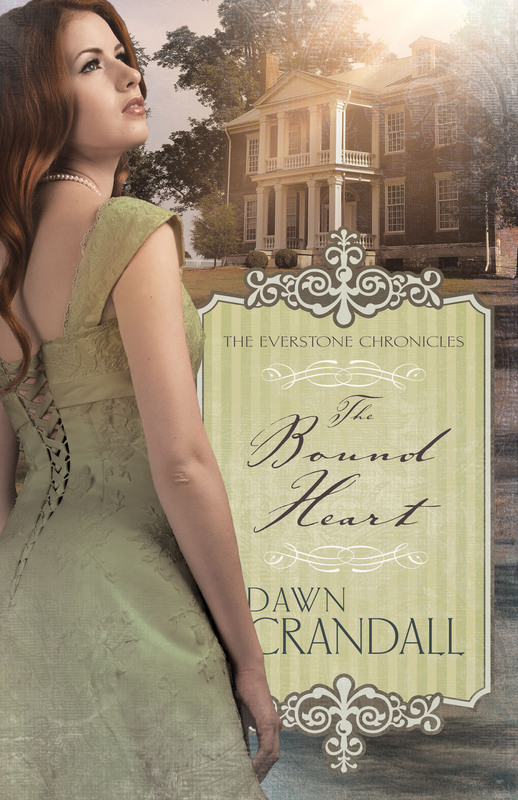 In Dawn Crandall’s beautifully written second installment of The Everstone Chronicles, The Bound Heart, she again tells an astonishingly honest story of a stuck young woman, grappling with the truth of her own desires and how God’s plan fits into her life. Meredyth Summercourt thinks she has her whole life figured out. Even though her own desires fall far from what society expects from her, she knows one thing is for certain: in order to recieve atonement for her sins, she must marry Vance Everstone. She is even at peace with the inevitability of it all, until an unexpected kiss lets her see what she is missing. Then, she begins to realize that there is more to life, and more to the equation of her happiness, than simply giving into what she feels is expected of her…and does that equation possibly have someone other than Vance Everstone walking her down the aisle? Lawry Hampton is a man of God and one of her oldest friends. He’s good with children and has a heart of gold. But, when it all comes down to it, does Meredyth really have the courage to act against the plans that she believes that God has set for her? And ultimately, even if God is forgiving, will she be able to forgive herself for how she has acted and move on to bigger and better things? All of these timeless internal conflicts and more face Meredyth as she struggles to make sense of her need to meet the expectations of society, her family, her love, her God, and herself. At the end of it all, one truth is certain: Sometimes God’s plans aren’t so different from our own; in fact, sometimes, the desires that reside in our hearts are put there by God—it just takes some faith to realize that He wants our peace and happiness just as much as we do. In Crandall’s story, it is up to Meredyth to release her heart and give into what is right. Rachel Carey is a recent graduate of the University of Delaware, trying to navigate her way through the “real” world, when really all she wants to do is write to make sense of it. 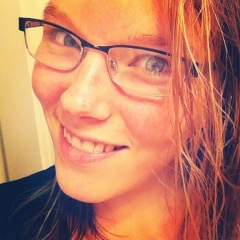 If you’re ever looking for her, you are most likely to find her with her nose in a book— either reading or writing. As far as the future, she knows that she will continue writing no matter what, but hopes to one day become more involved in the world of publishing— maybe even the publishing of her own novel! It’s release day for author Harry Wegley’s Triple Threat! A novel of thrills, conspiracy, romance, and faith, Triple Threat is everything this cover embodies through its attractive leading characters, vivid colors, and symbolic pieces indicative of the Wegley’s storyline. The sensational plot jumps off of the cover–the contrast of light sky and darker mountains leave nothing to chance that Triple Threat‘s leading characters will face forces of good and evil as they fight a conspiracy and opposing worldviews. Typically I stay within the genres of historical or contemporary inspirational literature; however, Triple Threat‘s cover is so appealing that I feel myself drawn to Wegley’s novel. The leading man and woman on the cover are individual enough to tell readers they have their own stories, but the emotions in their eyes also relay that romance will play a part in the novel. With the unique blend of love, faith, and adventure, Triple Threat could be just the novel to start me off on a new genre. What do you think of the cover of Triple Threat? What do you like about the cover or wish was different? H. L. (Harry) Wegley served 7 years in the USAF as an Intelligence Analyst and a Weather Officer. After leaving the military he worked for nearly 12 years as a research scientist in atmospheric physics at a national lab where he earned an advanced degree in Computer Science, then developed distributed computing systems for Boeing for more than 2 decades. Since retiring in 2008 he has attended several novel-writing workshops, seminars, and conferences and published several contracted books, including a devotional work and a series of novels. He is a member of American Christian Fiction Writers, Oregon Christian Writers, and Christian Author Network. Harry lives in the greater Seattle area with his wife of 48 years. When they are not enjoying grandkids, participating in church ministries, hiking the Olympic Peninsula beaches or occasionally traveling to snorkel tropical waters, H. L. writes inspirational thriller/suspense novels and continues to study the craft of writing fiction. It’s been a busy past few weeks here at A Way With Words! As the publishing industry pushes to get out as many books as possible before Black Friday, authors and bloggers are hitting their keys for interviews, posts, reviews, and more. Below are a few of the sites I have contributed to recently. Ever wondered what you would change if you had the chance to go back in time? Do you often think about what you’re thankful for as Turkey Day approaches? If you’re in need of some inspiration for your own writing, or perhaps just perusing your favorite blogs while searching for some new Thanksgiving recipes, check out my latest posts for some fun and heartfelt thoughts on the world around you. Author Bill Garrison interviewed me for his series on what we would change in our lives if we had the chance to time travel. What do you think of my answers? How would you respond to his questions? Over on Writing Prompts, Thoughts, and Ideas, Oh My! I discuss the many reasons I am thankful for the life I live. What you are thankful for?